When it comes to selecting a new pocket bike, especially if you are new to the sport, it can be very confusing. There are many choices and many classes of motorcycles along with many different manufacturers and companies. This page was created to help you decide which bike is right for you. When it comes to pocket bike companies, there are many choices... But there is only one RIGHT choice. MiniPocketRockets is the right choice. We carry only the top quality pocket bikes and super pocket bikes that you demand. All of the bikes we carry must meet our rigorous 57-point inspection before shipment. And every one of our bikes has been spec'd out to our requests and parameters. The smaller pocket bike class is great for serious racers and beginners alike. These little 2-stroke motorcycles can rev up to 10,000 RPMs and sustain that level throughout the entire gas tank of fuel. They are the lightest and most maneuverable, giving them an advantage on smaller courses and tracks where turning is essential to winning. They come with less bells and whistles than the super pocket bikes. They typically have pull start ignitions and come with no electrical components. Our lowest priced bike, the Cagllari Daytona pocket bike, also happens top be the lightest with the least amount of parts so replacement and repairs can be minimal, even in the event where the bike sustains damages from unfortunate encounters. The smaller pocket bikes are the choice for racers who are racing in heats where there are class limitations. The super pocket bikes are the choice for the rider who wants it all. Super pocket bikes provide a more comfortable ride with its cushioned seat and adjustable suspension systems. You also have the added convenience with these super pocket bikes because they offer electric start and kickstands that are built right into the frame. Super pocket bikes are the most realistic mini motorcycles around. Along with all the features mentioned above, most super pocket bikes also offer headlights, signal lights, horn, keyed ignition systems and sequential manual shifting. Super pocket bikes also add gauges in analog and digital, where applicable. But what really sets these super pocket bikes apart from the crowd is their 4-Stroke motors. Super pocket bikes accelerate as fast as a smaller pocket bike, but have top speeds that almost double the smaller bikes. Handling is a crucial aspect when we judge super pocket bikes. 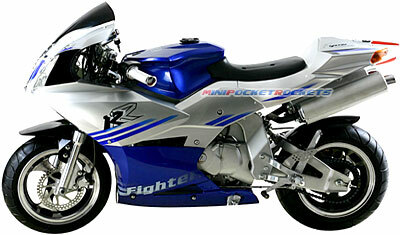 We at MiniPocketRockets have tested every super pocket bike on the market. Many designs were rejected due to unfavorable handling. Although their weight and size prevents them from being as nimble as the smaller pocket bikes on more technical tracks, our super pocket bikes handle so well for their size, they are more than capable for taking out even the smaller pocket bikes on a slightly larger track. All super pocket bikes we carry are also 100% EPA Approved and certified. This means that not only are super pocket bikes legal to own (as with almost every single one of the pocket bikes we carry), but they may also be registered with your local DMV. Again, before attempting to register these super pocket bikes, please do check with your local DMV offices, as your local laws may require some simple modifications (such as license plate holders). You can't go wrong with any of the bikes you see on our site. It just comes down to a matter of preference and need. Our mini pocket bikes will outperform the competition and bring you to the finish line first. Our super pocket bikes will let you rip at the highest top speeds in the industry. Our super dirt bikes will let you open a trail for others to follow. Our mini quads will give you 4-wheel action like no other. And our mini choppers will get you to your destination with the ultimate in sound and style.